Improved comfort. Same weight and rigidity. It’s Optimal balance at its best. With the Krypton, you enter a universe where the pleasure of riding rules all. Think of the spirit behind a brand, a company and the designs that rouse the sensations and emotions around the beauty of cycling. The Argon 18 Krypton is a manifestation of that spirit. The 2017 Krypton channels something of the Gallium Pro, because some of the features developed for our trophy bike have trickled down to the Krypton, turning an already exceptional bike into a potent expression of everything Argon 18 stands for. It is a leader in its class. The 2017 Krypton’s cushy comfort was developed through substantial experimentation with carbon layup and tube shapes. Every detail has been refined, to give the Krypton a benchmark ride that will let you discover handling skills you suspected you had but had never fully tapped into. Now built with our new 5750 HM carbon composite, the Krypton is the embodiment of Optimal Balance. Riders of all physical types will find it easy to set the perfect position thanks to our AFS geometry, with the 3D Headtube adding positioning versatility while retaining all of the bike's rigidity for comfort and accurate steering. Versatility of another kind is now also featured, since the Krypton can be equipped with Di2 or mechanical components with no extra parts required. The reversible ASP-1600 carbon seat post combines easy and exact adjustments and vise-like tenacity. 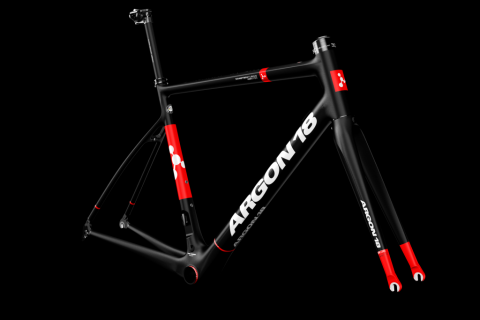 The spirit of Argon 18 is yours, with the 2015 Krypton. Available in Matte Carbon/Red or Gloss White/Carbon.